Whew! March flew by! We spent some time visiting with family this month and the rest of the time trying to get over the stomach bug. I didn’t want this month to escape however without sharing our latest family community project in our year of spreading the love. This month we decided to make “comfort bags” to donate to our local social services agency so they could give them to children who may be going through a scary and difficult time. I look at my children and I am so thankful that while we can’t give them everything they want, we are able to give them a stable, loving home life. There are so many children who will go to bed tonight, that for whatever reason, don’t have that luxury. There are children out there right now getting ready to go to sleep who maybe are in an unfamiliar bed and don’t know what tomorrow or the next day will bring for them. One of the hardest parts of giving is feeling like you’re not able to do enough BUT one of the greatest parts is – once you start, you want to do more – you find ways to do more. 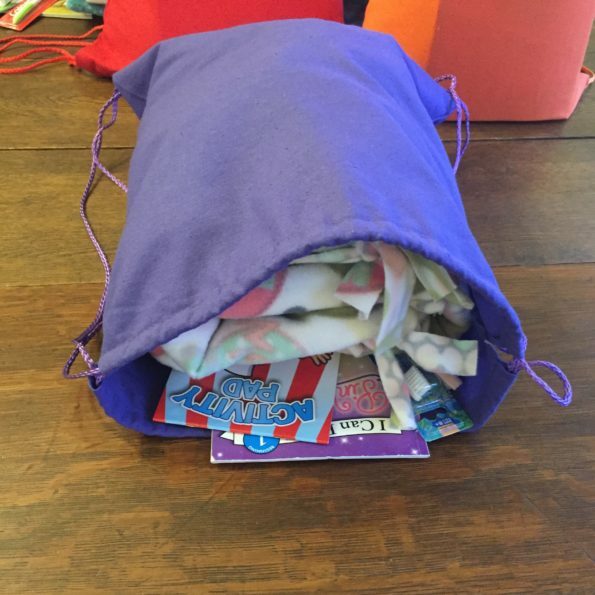 The comfort bags we are giving consist of a handmade fleece blanket, toothbrush and toothpaste, coloring book and crayons and a book to read. 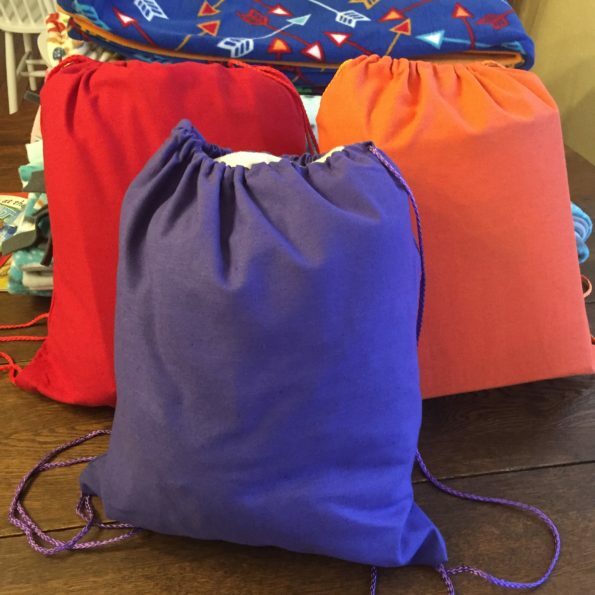 Originally the goal was going to be four bags – one from each of my kids where they could help make a no-sew blanket and assemble the bag items. However this particular month we had a little extra room in our household budget and after researching I found I could get a lot more for our money if I bought the bags and supplies in a lot of twelve. See what I mean about finding ways to do more. Even if we had just done four bags I would have been happy but I’m thrilled we could bump that number up to twelve. Four of the fleece blankets the kids helped me with as planned but the the other eight I found a lot easier to simply sew due to the fact I was manually cutting the slits in the blankets for the kids to knot – and spending hours hunching over doing that my friends is for the birds! Give me back my sewing machine! Sometimes my kids can’t always help with every step of the project and that’s OK. Even though I want them to learn to serve others through these lessons, the other big part is simply learning to become caring individuals. As a parent sometimes my natural instinct is to shield them from the social injustices of the world. It can be tricky – explaining to your five year old what foster care is and why some children need it, is not easy. However these projects are allowing me to expose these tougher topics and talk to them about it in an age appropriate way. Like I said we are donating our bags to our local social services agency however there are other wonderful organizations in my area that also help children in need, such as the Domestic Violence and Abuse Center and the Pregnancy Help Center. If you contact these agencies or agencies like these in your area they will have a list of items they are in need of. We plan to donate to these agencies in the future as well. Remember we may not be able to change the tides of the ocean but our little ripples can reach far. absolutely love what you and the family are doing Heather! !